STILLWATER, Okla., September 30, 2016 – Oklahoma State University (OSU) and the New York Philharmonic have announced a residency partnership marking the opening of the new McKnight Center for the Performing Arts at OSU in October, 2019. The partnership is made possible in part by the visionary $25 million programming gift to OSU by alumni Billie and Ross McKnight. The McKnights’ gift established a program endowment to benefit all students, faculty and the Stillwater community by bringing top-tier residency programs and performances to OSU. In addition to multiple New York Philharmonic performances at the McKnight Center conducted by future New York Philharmonic Music Director Jaap van Zweden, the residency partnership will include educational opportunities for OSU students with Philharmonic musicians and management, such as masterclasses, audition workshops and lectures. Every season the Philharmonic reaches millions of people through concerts at Lincoln Center in New York, worldwide tours, educational activities and outreach. The partnership with OSU adds to the Philharmonic’s growing list of educational partnerships throughout the U.S. and world, which includes the University Musical Society at the University of Michigan and New York Philharmonic Global Academy partnerships with Santa Barbara’s Music Academy of the West, The Shepherd School at Rice University and the Shanghai Symphony Orchestra. “We salute Oklahoma State University, under the leadership of President Hargis, and the McKnights for their vision and generosity that will bring the New York Philharmonic to OSU to help launch this ambitious initiative and make the arts more central to the campus,” commented Matthew VanBesien, president of the New York Philharmonic. The new partnership will be celebrated at tomorrow’s groundbreaking event featuring President Hargis, the McKnights, VanBesien and student performers from the Department of Music. The celebration will continue during a special halftime performance at the OSU vs. Texas football game in Boone Pickens Stadium. The program will feature a special tribute by The Cowboy Marching Band. 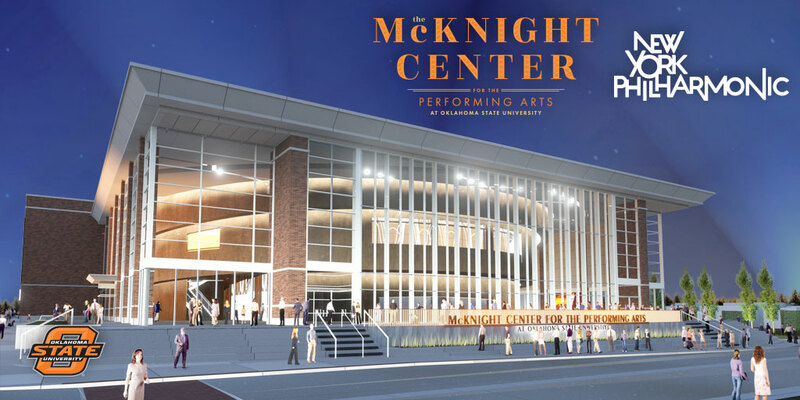 The McKnight Center for the Performing Arts will be one of Oklahoma’s premier cultural institutions, creating an environment for artistic expression that allows Oklahoma State and the Stillwater community to express — and be recognized for — their passion for the arts on a global stage. The performing arts center will stand prominently along the southwest corner of University Avenue and Hester Street within walking distance of the Student Union, the Atherton Hotel and the ConocoPhillips OSU Alumni Center. The 93,000-square-foot McKnight Center for the Performing Arts will include an acoustically perfected 1,100-seat performance hall, 222-seat recital hall and an outdoor amphitheater with a large viewing screen for broadcasting performances in the hall as well as other performances from anywhere else in the world. It will also include a new home for the Department of Music and its masterclass curriculum, teaching studios for one-on-one lessons and ensemble rooms for small or large groups. These spaces will be engineered with the latest acoustics and technology for instruction, practice and performance. “The McKnight Center for the Performing Arts sets the foundation to invite world-class musicians and artists to Stillwater, Oklahoma. The residency program with the New York Philharmonic begins a new era for performing arts at our school and in our state.” Dr. Howard Potter, professor and head of the Department of Music in Oklahoma State University’s School of Visual and Performing Arts. VISUALS: To download b-roll, logos and photos regarding the groundbreaking event and announcement, please visit: Media Downloads. The Oklahoma State University Foundation, the private fundraising organization for OSU, exists to unite donor and university passions and priorities to achieve excellence. The Foundation manages donor contributions so the university can provide the most advanced educational opportunities to students. From scholarships to community programs to important research, OSU donors generously support the spirit and tradition of Oklahoma State University’s land-grant mission. OSU supporters fuel our historic growth and unprecedented excitement. We continue to witness an ongoing transformation at Oklahoma State, and all gifts help ensure we continue this tradition of excellence. The New York Philharmonic connects with up to 50 million music lovers annually through performances, education, broadcasts, and the Digital Archives. The 2016–17 season marks the Orchestra’s 175th anniversary and Music Director Alan Gilbert’s farewell season. The Philharmonic has always championed contemporary music, with current projects including the NY PHIL BIENNIAL. The annual free citywide Concerts in the Parks, presented by Didi and Oscar Schafer, are complemented with Philharmonic Free Fridays and education programs, including the famed Young People’s Concerts and the New York Philharmonic Global Academy, collaborations with partners worldwide to train pre-professional orchestral musicians, often alongside performance residencies. America’s oldest symphony orchestra has appeared in 432 cities in 63 countries and long been a media pioneer, today sharing live performances through downloads and online. Alan Gilbert became Music Director in 2009 — succeeding titans including Bernstein, Toscanini, and Mahler. Jaap van Zweden will become Music Director beginning in the 2018–19 season, after serving as Music Director Designate in 2017–18.